We were fortunate enough to see a few of the last remaining grey ghosts while hiking up in the Tonquin valley. This Mountain Caribou bull had a fresh set of antlers still bright from the recent removal of their velvet covering. It seems increasingly likely that unless the populations stabilise in the next couple of years, we will see the Mountain Caribou disappear from the Canadian Rockies in a similar way to its disappearance in the lower 48 states of the US. 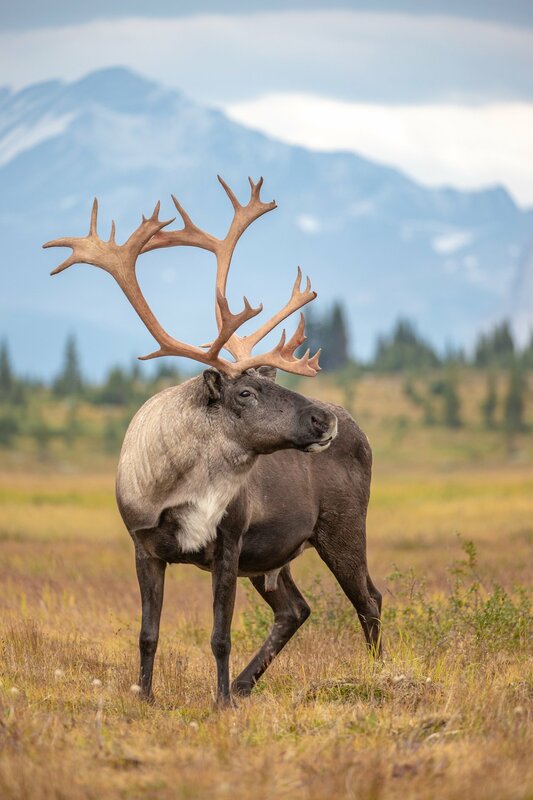 Classified as endangered in Canada, Central Mountain Caribou across Alberta and B.C declined by 60 per cent between 2004 and 2014 to just over 500 mature individuals in 11 herds. The Tonquin herd was counted at 30-40 animals in 2016; down from approximately 110 in 2006. Small populations are particularly vulnerable to stochastic events, which has led to several assessments of the Tonquin caribou range as non-self-sustaining. The Tonquin herd is the largest in Southern Japser, the other two herds, Maligne and Brazeau, have both collapsed down to fragments of their former numbers and are considered functionally extinct. The Maligne herd has dropped from over 100 animals down to just 3 in the same period of time. A complex issue with no easy solutions. You can see a previous posts I had published on the Mountain Caribou here. Thanks. Hope you enjoy your day as well! So majestic and beautiful @intrepidphotos! Thanks. Very kind of you. And thanks for the resteem. That is a great clean shot. Thanks. We were super lucky to see one given how rare they are. Thanks. It is super sad and most people are not aware these great creatures are being lost. Your UA account score is currently 4.932 which ranks you at #1202 across all Steem accounts. Your rank has improved 35 places in the last three days (old rank 1237). In our last Algorithmic Curation Round, consisting of 219 contributions, your post is ranked at #84.